It’s scary. It’s one of the hardest pieces of the planning puzzle. It goes up, and it goes down. It’s a focus of conversation with your groom, your family, and your conscience. Decisions, decisions…..
Who makes the cut? What co-workers get the lucky invite in the mail? Is your mom going to kill you if you don’t send an invite to that 2nd cousin from Nebraska that you havent seen since you were 12? 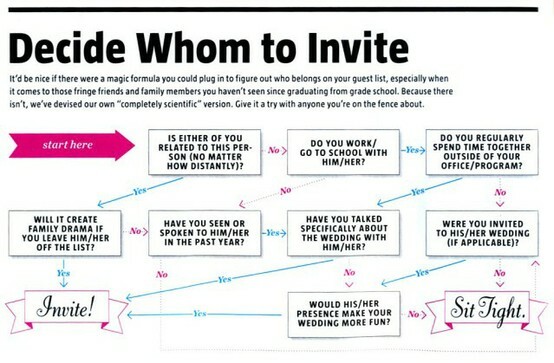 If you are having a very small wedding, this is a bit easier. Obviously it’s family and CLOSE friends, and that’s it. No co-workers, no distant relatives. Or, on the flip side, if you are having a large wedding, the stress of getting to a certain number isn’t as crucial. Heck, invite them all! If you can afford it, and want the big party, have your parents invite the neighbors, why not? The more the merrier! But, most of the couples I see who struggle with this have the in-between wedding count. Hoping to stay between 100-200, it can get a bit harder. If you or your groom has a big family, there is 40 guests right there! I know it may seem impossible! Please know that you should invite who you want to invite, and hope everyone understands in the end. Dont be pressured into inviting someone, and don’t spend too much time stressing about it. It’s a celebration that is meant to be shared with family and friends, most of whom should know you and your groom as a couple and have somehow shared in your lives in an important way. These are the people who love you and are thrilled to see you so happy. These are the people who know your past, or play a part in your present. Start with family. Add in close friends (friends you talk to on a weekly basis or see regularly). Then look at old friends and co-workers that you have a relationship with currently. The best question to ask yourself is “will this person be in my life in 5 years? 10 years?”. If you think you may look at your wedding album in 20 years and not be able to remember someones’ name, you can probably take them off of the list. If you’ve never talked to this person outside of the office, don’t let your wedding be the first time. No harm, no foul. Choices on whether or not to have kids or to allow that single friend to bring a “plus one” may be the most sensitive. Use discretion on this. Most of the time it really depends on your family, your friends, your relationship with the guest. If your guest count will grow by 30 if you invite the little ones, it may be best to omit. Black tie affair…? May not be to child friendly, and your guests may really enjoy a night out on the town as a couple. Have that friend that brings a random girl to every social event that you never see again…? Ask him to fly solo and sit him with a fun group of other guests. He’ll have a great time, random date or not. Bottom line, it is your day, your celebration, your money. Being invited to a wedding is an honor, a privilege. Dont forget that! Your guests will understand the choices you make and will be supportive if they love you. It’s not about them after all…. it’s all about you! Next Post longest married couple in the country!